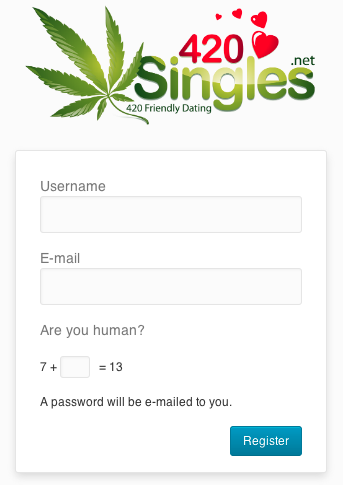 420Singles.net is a new online dating site designed specifically for stoners. There seems to be a rise in 420 Friendly Dating with a lot of site adding in the feature to mention this to your matches, but 420Singles gets right down to business since everyone on this site is game to smoke a joint. The set-up process is as simple as it gets, all you need is a desired username and an email address and you’re ready to go, or so I thought. You do need to fill out the info in your profile before you can do a search or browse for singles. The profile is a bit of fun to fill out asking you some unique questions. There is obviously questions about smoking marijuana like whether you prefer Indica or Sativa and how frequently you smoke pot, they give you an option for “a few times a month” I feel if that’s the case you don’t have to use a dating website catered specifically to heavy pot smokers. They also have some great questions related to subjects I think most stoners are familiar with like television and movies. They ask what your favorite T.V. genre is, but they have some weird choices, like “BET” or “MTV” the first one seems a bit racist and the second one just makes me sad for our generation. Also, under education there is an option to select “Confused” which I found rather amusing. - Basic and Advanced searches allow you to narrow the field and find that perfect stoner you’re looking for. Although, when I did a search it yielded only 6 results! and it was a general search for females in New York City. Apparently there are only 6 female members in all fo New York using the site!? You can also do a zip code search, which yielded an even more disappointing amount of results. - The site features a blog from the marijuana advocacy group NORML which features all the news from the world of marijuana legislation and potential legalization. It also features a lot of great articles about the stigmas surrounding the associated health problems and potential for the substance to be used for medicinal purposes. - The homepage features an open chat section that any member can post in. It’s an open conversation for anyone to say whatever they like about any subject and its also a place to connect with other members. - The site offers a “Stealth Mode” to hide your online status from other members. Stealth mode also hides your profile from public view for not logged in members browsing the site. - The site has a link called “weed maps” that gives you a link to a website that shows you where all the legal marijuana dispensaries are in the country. Now how you can be able to purchase pot from said dispensaries is a different question, but I’m sure the NORML blog has a post about the subject. - The site also has links to the Reddit pages for “trees” and “cannabis”, which I imagine most of the sites members frequent regularly. - The site is %100 free to use and at no point do they tell you that an upgrade is need to use a feature or communicate with a member. Although while using the site you are constantly reminded of the fact its free due to its lack of any real substance. For example, when I check to see which members were online at the time there was only one, which was myself. - The site allows you to express your feeling and thoughts about the subject of marijuana by giving you the ability to create a blog post which will appear on your profile page. You can add as many posts as you like on any subject. 420Singles lacks any real substance when it comes to features or function. A lot of the tabs I clicked on and pages I visited lead to blank pages with no information on them at all. A lot of the profiles didn’t have profile pictures. Is this cause most stoners are lazy or is it the fact that your posting your face onto a website for people who are essentially a community of criminals since, as terrible as it is, marijuana is still technically illegal. The site does state, just because a member is using the site it doesn’t necessarily mean they are admitting to smoking marijuana. If someone regularly smokes pot and wants to find a person to get high with that’s fine, but if marijuana is the most important think in your life, then I feel bad for you. You can briefly view the members on the site before signing up, but once you create a free membership the sites makes you fill out every possible field in your profile before you are allowed to do anything on the site which is mildly annoying. I clicked on the “extras” tab and to my surprise there was nothing extra being offered? It was just a few of their basic features like people I viewed and people who viewed me. There is also a tab to “Upgrade Account” but nothing comes up when I click on it. Hopefully they weren’t planning to get a bunch of member and then decide to start charging them, this likely wont happen since the site has a very low number of members still.